Environmental Studies of the World Trade Center area after the September 11, 2001 attack. Navigating through this report: At the end of each section will be a link to the next section in the sequence below, or click on the links to go directly to a section or sub-section. Field spectral measurements and calibration site. This web site describes the results of an interdisciplinary environmental characterization of the World Trade Center (WTC) area after September 11, 2001. Information presented in this site was first made available to the World Trade Center emergency response teams on September 18, 2001 (Thermal hot spot information), and September 27, 2001 (maps and compositional results). 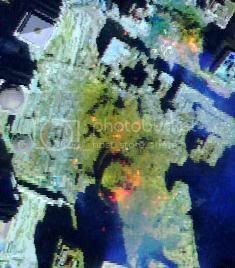 The Airborne Visible / Infrared Imaging Spectrometer (AVIRIS), a hyperspectral remote sensing instrument, was flown by JPL/NASA over the World Trade Center (WTC) area on September 16, 18, 22, and 23, 2001 ( Link to the AVIRIS JPL data facility). A 2-person USGS crew collected samples of dusts and airfall debris from more than 35 localities within a 1-km radius of the World trade Center site on the evenings of September 17 and 18, 2001. Two samples were collected of indoor locations that were presumably not affected by rainfall (there was a rainstorm on September 14). Two samples of material coating a steel beam in the WTC debris were also collected. The USGS ground crew also carried out on-the-ground reflectance spectroscopy measurements during daylight hours to field calibrate AVIRIS remote sensing data. Radiance calibration and rectification of the AVIRIS data were done at JPL/NASA. Surface reflectance calibration, spectral mapping, and interpretation were done at the USGS Imaging Spectroscopy Lab in Denver. The dust/debris and beam-insulation samples were analyzed for a variety of mineralogical and chemical parameters using Reflectance Spectroscopy (RS), Scanning Electron Microscopy (SEM), X-Ray Diffraction (XRD), chemical analysis, and chemical leach test techniques in U.S. Geological Survey laboratories in Denver, Colorado. The dusts released from the WTC building collapse are largely composed of particles of glass fibers, gypsum, concrete, paper, and other miscellaneous materials commonly used in building construction. Laboratory analyses (RS, SEM, XRD) have detected chrysotile asbestos only in trace levels (less than 1 weight percent) in over two thirds of the dust and airfall debris samples. To date, no amphibole asbestos minerals have been detected in any of the dust samples. For definitions of asbestos, CLICK HERE (use the back button on your browser to return here). Laboratory analyses of the material coating a steel beam in the WTC debris have detected the presence of chrysotile asbestos (a serpentine mineral) at levels as high as 20% (by volume) of the coating material. No amphibole asbestos has been detected in this beam coating material. AVIRIS mineral maps do not show widespread distribution of chrysotile or amphibole asbestos at the few-percent detection limit of the instrument at the ground surface. AVIRIS mapping keyed to the detection of minerals that may occur in asbestiform habits has identified isolated pixels or pixel clusters (each pixel is approximately 2m x 2m) in the area around the WTC. In these areas, potentially asbestiform minerals might be present in concentrations of a few percent to tens of percent. Some spectral absorption strengths in the AVIRIS data are similar to those observed in spectra of the chrysotile asbestos-bearing beam coating. The absorption features mapped by AVIRIS only indicate the presence of serpentine mineralogy and not if the serpentine has asbestos form. Non-asbestiform serpentine minerals can occur naturally in rocks and such rocks may have been used in building materials. The AVIRIS maps could indicate areas of higher concentrations of asbestos or simply areas of non-asbestiform mineralogy and would need field sampling and laboratory analysis to confirm the presence of any asbestos. The AVIRIS maps show the surface materials only and not any buried materials. AVIRIS mineral maps show a few isolated pixels of amphibole minerals, but these pixels are isolated with no clusters like those seen in the chrysotile pixels. The few mapped amphibole pixels are at a statistical noise level in the WTC area similar to the pixel noise level mapped throughout the city. The absorptions mapped by AVIRIS only indicate the presence of amphibole mineralogy, which can occur naturally (non-asbestiform) in rocks that are used in building materials, and field sampling of those pixels would be necessary to confirm the presence of asbestos. The AVIRIS maps of serpentine chrysotile and amphibole mineralogy are consistent with laboratory analyses of the field samples. Laboratory analyses and the AVIRIS mapping results indicate the dusts are variable in composition, both on a fine scale within individual samples and on a coarser spatial scale based on direction and distance from the WTC. Replicate mineralogical and chemical analyses of material from the same sample reveal variability that presumably is due to the heterogeneous mixture of different materials comprising the dusts. The spatial variability is observed at large scales of tens of meters to centimeter and smaller scales. AVIRIS mapping suggests that materials with higher iron content settled to the south-southeast of the building 2 collapse center. Chrysotile may occur primarily (but not exclusively) in a discontinous pattern radially in west, north, and easterly directions perhaps at distances greater than 3/4 kilometer from ground zero. Although only trace levels of chrysotile asbestos have been detected in the dust and airfall samples studied to date, the presence of up to 20 volume % chrysotile in material coating steel beams in the WTC debris, and the potential areas indicated in the AVIRIS mineral maps indicates that asbestos can be found in localized concentrations. Chemical leach tests of the dusts and airfall debris samples indicate that the dusts can be quite alkaline. When reacted with rain water or wash water from cleanup efforts, the dusts can produce slightly alkaline to very alkaline solutions, due to partial dissolution of concrete, gypsum, and glass fiber particles. Indoor dust samples generated the highest pH levels (11.8) in the leach tests, indicating that dusts that have not been exposed to rainfall since September 11th are substantially more alkaline than those that have been leached by rainfall. At least some heavy metals and metalloids (such as aluminum, chromium, antimony, molybdenum, and barium) are readily leached from the dusts into rain or wash water. Indoor dust samples showed greater proportions of leachable metals than outdoor dust samples. These metals may also be potentially bioavailable if the dusts are accidentally inhaled or ingested. Chemical leach tests of the material coating steel girders in the WTC debris indicate that the coatings can contain soluble chromium. AVIRIS data collected on September 16, 2001, revealed a number of thermal hot spots in the region where the WTC buildings collapsed. Analysis of the data indicated temperatures greater than 800oF in these hot spots (some over 1300oF) . Over 3 dozen hot spots of varying size and temperature were present in the core zone of the WTC. By September 23, most of these fires that were observable from an aircraft had been eliminated or reduced in intensity. Our finding that trace levels of asbestos are present in the dust samples is consistent with results of other studies carried out by the U.S.Environmental Protection Agency (www.epa.gov). Our results provide further clarification by showing that 1) elevated concentrations of asbestos may be present in beam coatings and possible localized area as indicated by the AVIRIS maps, and 2) asbestos in the dusts and beam coating materials is composed only of chrysotile asbestos and does not contain amphibole asbestos. A significant body of research conducted over the last twenty years by toxicologists, epidemiologists and mineralogists has indicated that chrysotile asbestos is less carcinogenic than the amphibole asbestos minerals (Ross, 1999; Skinner et al., 1988; Van Oss et al., 1999; McDonald, 2001). This conclusion, however, has not been universally accepted by the scientific community. A recent and thorough discussion of these ongoing issues can be found in Nolan, et al. (2001). Results of our mineralogical characterization studies, chemical leach tests, and AVIRIS mapping provide further support for the EPA and New York Department of Public Health recommendations that cleanup of dusts and the WTC debris should be done with appropriate respiratory protection and dust control measures. These results include: the presence of up to 20 volume % chrysotile in material coating steel beams in the WTC debris (which could be unintentionally released into the air as dust during cleanup); the small areas in the AVIRIS mineral maps indicating that asbestos might be found in localized concentrations in the dusts; the highly alkaline nature of the dusts; and, the presence of potentially bioavailable metals in the dusts. Next section: continue to the Introduction, below. The information in this report describes the results of an interdisciplinary environmental characterization of the World Trade Center (WTC) area following requests from other Federal agencies after the attack on September 11, 2001. The scientific investigation included two main aspects: 1) imaging spectroscopy mapping of materials to cover a large area around the WTC and 2) laboratory analysis of samples collected in the WTC area. Spectroscopy is a tool that detects chemical bonds in molecules (solid, liquid or gas) through absorption (or emission) features in the spectrum of the material. Imaging spectroscopy obtains a spectrum for every spatial pixel in an image format. Data from the Airborne Visible/Infrared Imaging Spectrometer (AVIRIS) were collected over the WTC area by NASA/JPL for this study. The results of the imaging spectroscopy mapping are shown below. The analytical techniques applied to this study include X-Ray Diffraction (XRD), Scanning Electron Microscopy (SEM) with elemental analysis by Energy Dispersive Spectroscopy (EDS), laboratory Reflectance Spectroscopy (RS), leachable metals, and X-Ray Fluorescence Spectroscopy (XRF). For definitions of asbestos, CLICK HERE (use the back button on your browser to return here). Ground sampling consisted of collecting debris from 35 locations in the WTC area, including 33 dust, 2 concrete, and 2 steel beam insulation samples. Optical photographs of a typical dust sample on the left (sample WTC01-27) and what appeared to be an insulation coating from a steel beam on the right (WTC01-8). The coating contains as much as 20% chrysotile asbestos. Scale bar is 10 millimeters. The objective of the laboratory analysis was to characterize the samples for potential environmental impacts and to provide feedback to imaging spectral analysis and field confirmation of the imaging spectroscopy results. In certain cases the laboratory studies provide better detection levels than airborne imaging spectroscopy, thus providing complimentary information that allowing a more robust characterization of the entire site.